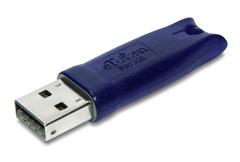 A USB Tokens may be a physical device that an authorized user of computer services is given to ease authentication. USB tokens are used to prove one's identity electronically (as in the case of a customer trying to access their bank account). The token is used in addition to or in place of a password to prove that the customer is who they claim to be. The token acts like an electronic key to access something.